Every year Pakistan has to face one of the most disastrous catastrophes in the world which is flood. These floods caused hundreds of death, injuries and destruction of thousands of houses every year. This is not only due to lack of facility or human resource, but due to the complicated geography of the country. One of the most crucial issues that the government has to face is to remain up-to-date with the progress on flood relief development and work. Punjab Information Technology Board (PITB) has developed a real time flood monitoring dashboard through the use of information technology to sort out this issue. During the flood season the dashboard by PITB is updated with a disaster bulletin on hourly basis by PITB and concerned departments. The bulletin will help to reveal the most recent flood stories by giving details about the flood affected areas, the injuries and the death toll. 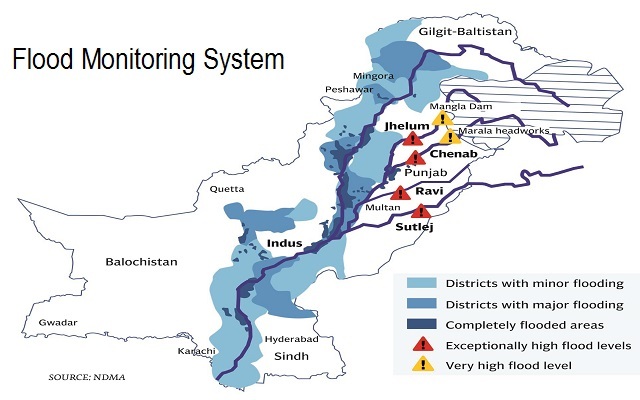 Flood Monitoring System has proved to be of great benefit to the government and flood relief organizations especially. It also highlights the development at the water works (be it the normal water flow or on an alert) along with situation of the roads. The Flood Map in the system reveals the overall flood hit areas. Every year this happens when flood hit Pakistan. Heavy rain results in high levels of floods in Rivers Indus, Chenab and Jhelum that affect surrounding districts drastically. These Floods then move towards the southern region of the province and cause water borne diseases in villages and town leading to health and medical issues that further causes issues for the government and flood relief organizations to handle. Through Flood Monitoring System the government will be able to take real time relief and migration measures. This will minimize the possible chaos in such disastrous circumstances.